DIMENSIONS - W" x D" x H"
10" x 6" x 8"
4 1/8" x 3 3/4" x 3 1/4 To 7 1/2" x 3 3/4" x 5 7/8"
9" x 8" x 9"
7 1/2" x 4" x 4 1/2"
7" x 4" x 6 "
7 1/2" x 4" x 4 1/2 "
Did you know that acrylic riser sets is also often called plastic risers, lucite riser, acrylic display riser, clear acrylic riser, acrylic u-shaped riser, plexiglass riser, acrylic cube riser, acrylic u riser, plexi cube riser, acrylic riser stand, food risers, acrylic pedestal, lucite risers, and cube riser. 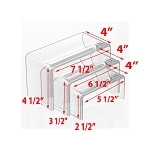 At CCPdisplays.com , we take pride in the number of clear acrylic riser sets we produce. We carry a number of different style and sizes to choose from all in stock ready to ship. Our plastic riser sets are manufactured right here in our factory in the USA. Acrylic riser sets are a great way for product display which increases visibility and creates a very attractive display look. Retail display risers are ideal for elevating products up for items such as jewelry, store products, and food items. Any of our Acrylic Riser Sets can be mixed and matched to create an awesome visual presentation for your merchandise. 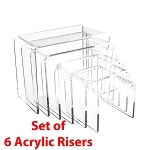 Other acrylic riser sets such as Acrylic Riser Sets - 6 x 6 x 6 - 8 x 8 x 8 - 10 x 10 x 10 - 12 x 12 x 12 and Beveled Riser Set - 5 1/2 x 4 x 2 1/2 - 6 1/2 x 4 x 3 1/2 - 7 1/2 x 4 x 4 1/2 can be used for various retail settings. Our acrylic mirror riser and beveled acrylic risers in a retail setting makes a product standout and says "Hey I'm Special". So if you need an acrylic riser set with a little flash - check out our Mirror Acrylic Riser Set or any of our Acrylic Riser Sets. Need something more specific. See all our other acrylic risers - Acrylic Riser . All our stock and custom acrylic risers come with polished edges. If you do not see the acrylic riser listed in the size needed just Contact Us . No minimums. Fastest turn around time in the US. CCPdisplays.com - Your Clear Acrylic Riser Display Choice.